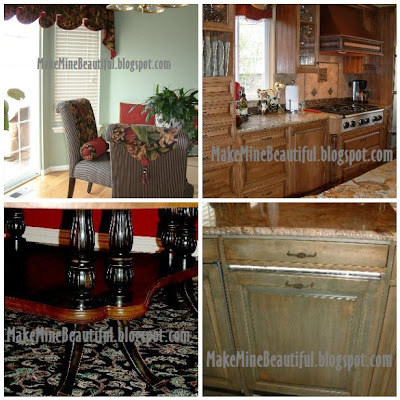 Blackberry House blog retail shop projects and painted furniture: I'm a Designer and I'm a Seamstress. So What Does That Mean for You? I'm a Designer and I'm a Seamstress. So What Does That Mean for You? WARNING: This is a very long post, but there is a purpose to it. Read On. I am a designer. I design. I decorate. I build. I paint. I create. I sew. And I teach others to sew. that it might not otherwise have had. I thrive on being able to bring a client's vision to fruition. I decorate because I love to see beautiful art, accessories, furnishings, and paint make such a statement that it somehow moves me. I build things because I just can't help myself. The more I make, the more I learn, so I keep going. I own most every tool known to man woman. I paint things because it provides a transformation that gives you the biggest bang for your decorating buck. And it makes me giddy to see that happen. I create things because I collect so many trinkets I have no choice but to start making things with all of it. And, I sew. I sew because it is my favorite thing to do. I sew because I get excited when I see the magic that takes shape from a piece of fabric. 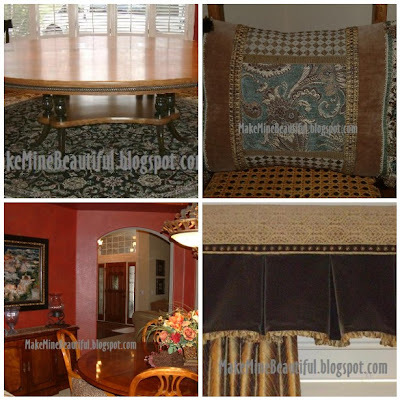 I sew because I can turn a bolt of fabric into a wonderful slipcover that can makeover an old sofa in an instant. And because I can make pillows with luscious trims and fabrics that look like you found them in a French Bed & Breakfast. I love to sew. Well, you've seen the whimsical, the philosophical, the nuturing, the fun side of me, and the side that can't shut up. Now I'm going to show you the serious side of me. The side that is all business. The side of me that makes a living. The side that only my clients see. I want to share some of my design work with you. 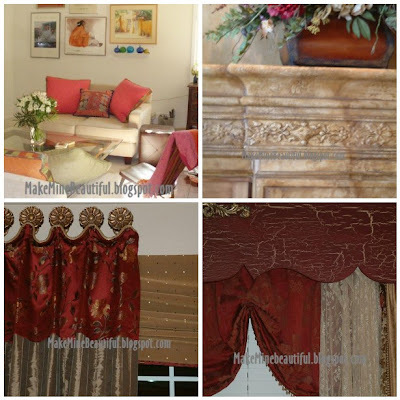 Some of my client's homes. And some of what that seamstress side of me can do too. And then, when you're done looking through the pictures, read about why I am writing this post, and how it can benefit you. I'm starting something new in February and I'd like for you to help me make it successful. I'll give you a hint. Would you like to learn sewing tips from a professional seamstress? Someone that can walk you through your project without headaches? Would you like to be able to ask a professional designer questions without having to bring them to your house? Do you need general advice on your home, or thorough advice on a project? Then keep reading..................I can help. Whew, that was a lot of picture editing! I love to teach people how to do things, and I want to start to teach you if you'd like to learn. Starting in February, you'll see BRAND NEW features on my blog, customized for you, and by you. I want to teach you what you want to learn. It's that simple. So what I'd like for you to do is tell me what that is. Do you need sewing tips? Would you like to know how to make a corded pillow? With a zipper? Or a duvet? Or a slipcover? Maybe a bedskirt? Would you like to know why you machine is giving you fits? What's causing that thread nesting? Why are you getting runs in your fabric when you sew? What size needle do you use for what type of fabric? What is that sound your machine is making? How do you know when to oil it? What is the difference in one paint vs another? 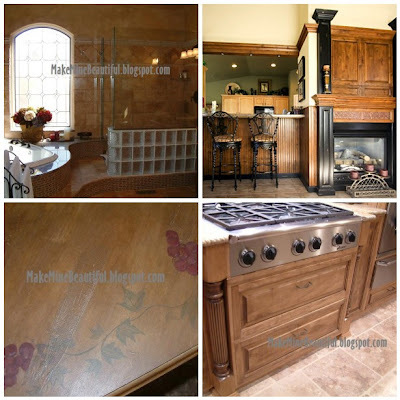 How do you choose the right countertops for your kitchen. I could keep asking you the questions, but I'd rather you tell me what you'd like for me to talk about, explain, show you, teach you, etc. I want to help. Please help me by spreading the word. I'm starting a Home Decor Help Series. This is where I'll cover your machine troubleshooting questions. This is where I'll give you the secret to tips and tricks in the workroom that can help you save time. Feel free to submit your own tip for me to feature. The second Wednesday of every month will be WEDNESDAY IN THE WORKROOM. This is where I'll cover whatever I'm working on at the time. This is also where you'll learn to make wonderful creations for your own home and be able to add that extra bling without fear. The second and fourth Friday of the month will be DESIGNER FRIDAY. This is where I'll answer the questions you've submitted to me via email about your decorating and design dilemas or curiousities. Your very own design forum, right here inside this blog. So what do you think? Are you ready to get on board with me? Start your questions right here in the comments thread. I'll be gone until January 15th, and I'll leave this as the first post you see until then. I want to give enough time for you to post your questions. Please pass the word. IT'S FREE. When I return, you'll see the new links to submit your questions in the header. I'm creating a navigation bar just for this so that you won't have to go back and find this post. And, I'll remind you a few days before each feature incase you've come up with a new question. DISCLAIMER: (so to speak). I do not sew clothing, so I will not be covering that. If you have questions about quilting, well, I'm not a quilter. This is solely a home decor series. I am really looking forward to this series from you. I know I'll learn a lot. A zipper tutorial would be helpful to me. I've never tackled that. I'm going to be making curtains for multiple room for a house my mom is renovating. She likes long panels and if you have any tips on making those, I could really use them. Oh YES,Yes, and Yes! All of the above and I am soooo excited! You are so very awesome to be doing this! Oh I am excited!!! I love all of your pics!!! I like to see transformations!!!!! I am trying to pick counter tops for my kitchen. I get a mental block when it comes to my own house!!! LOL Thanks for doing this!!! What a wonderful idea and how nice of you to share your time to help all of your blogland friends! This is quite an undertaking on your part and you are to be commended. I can not wait. Your home is so beautiful and you have such an incredible gift. Thank you for sharing your talents. 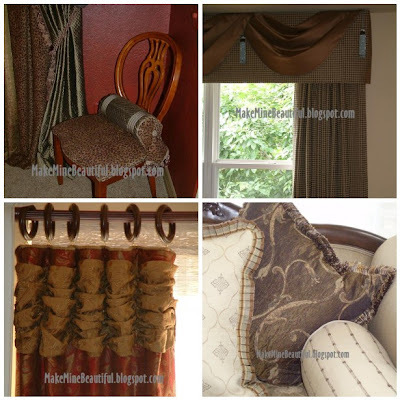 I would love some help making curtains. What a great idea! Looking forward to all the tips and tricks you can share. While I know the basics of a sewing machine, I am excited to learn more about maintenance- like when and how to change the needle. How sweet of you to share your ideas with all of us, I can't wait! 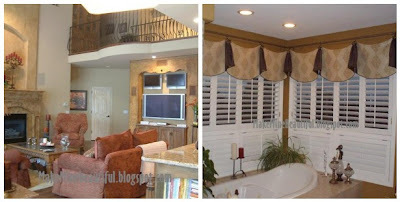 You are so inspiring and your home is GORGEOUS, so I am thrilled! Oh be sure and count me in on this. I am fixing to buy my first ever sewing machine and know that I will have lots of questions for you then. Till then anything you would like to share I'm sure I'll be here. It's exciting to see such a great response. Helps me to know I made the right move in doing this. Just an FYI - (Treasia and others), I will be sharing tips on how to buy the right machine. Let me know what you'd like answered. I'll be tuning in for it ALL. Sewing machine questions - you simply cannot get too elementary for me. I'd like to know from point A, everything. Especially how often should one get a machine tuned up and is this something we can do ourselves or must we send it in? Cool!!! I would love to learn from your expertise!!! How generous of you to share your experience! Curtains with the little pleats at the top, I dream of them I bought beautiful gorgeous material a few years ago so much has happened since,but I still dream of those curtains. Would love some help ! Wow Polly! This is great. I will be here everyday(I am anyway) to see what you share. What a generous thing for you to do. It will be exciting seeing what people are interested in learning. I'm sure I will pick up some tricks along the way too. I just came across your blog not too long ago & have it bookmarked. Love it!! I would like tips/ideas on decorating the walls a "u" shaped staircase. (There's probably a real name for those..! )I just don't know what to do there. So cool of you to share your talents this way!! I will definitely link you on my page, and follow along. Sewing is scary to me. Maybe this will be the inspiration I need! I just found your blog...was blog skipping today! Hehe! My friend, I'm just elated to have found you and your delightful blog!!! I love, love, LOVE your new ideas of sharing your creative talents and skills with us...count me in!!! This is exactly what I'm looking for in the way of blogs...I sooo want to learn how to do different things!!! I love sewing, decor, etc...I'm just an ameteur at best. I just wished you could hear the excitement in my words...I'm really, really looking forward to all of your new "How To" series!!! I am also adding your delightful blog to my list of blog follows...I'm looking forward to all of your upcoming posts (hehe...I think I've said that already!) and I'm also looking forward to going back through all of your past posts! I'm just so happy to have found you!!! So very nice to meet you, Polly!!! I picked up an old window on the side of the road and am looking for just the right thing to do with it. Any suggestions? 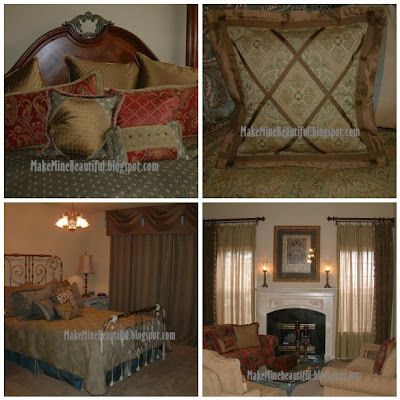 Those are awesome pics Polly, and I envy your decor skills and that you've made your house such a sweet home! I'm all in for this plan of yours, would like to learn a whole new lot of things from you..and you're being so gracious sharing your secrets with us! !